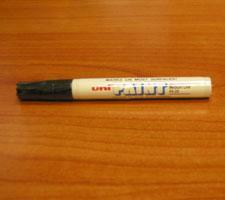 Black Paint Pen by Uni-Paint - Thin Tip | Sports Memorabilia! Black Paint Thin Pen by Uni-Paint. This is a great pen for autographing jerseys on the numbers when a finer tip is needed. Simply shake to get started and depress the tip. These paint pens work best for chrome helmets along with many other items such as photos, helmets, jerseys, etc.